We're glad to announce the most impressive upgrade since the launch of Koinup. 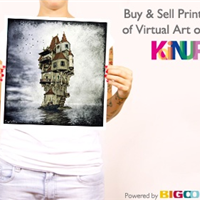 Thanks to a deep integration with the print service company Bigoom, you can now turn virtual art in physical objects and sell or buy prints of Koinup images. For sellers: Koinup allows to send automagically Koinup images to Bigoom, turn the images in prints and display back on Koinup the link to the prints shopping cart page. For buyers: if you see the buy prints button in a koinup page, it does mean that prints are available for such images and that you can buy them. This integration is made possibile by Bigoom API, that allow websites as Koinup to integrate with their ecommerce, printing and logistic plaftorm. Read the FAQ, register on Bigoom, Link Bigoom to Koinup.